These are so handy to have in the cupboard especially for taking out and about. Easy to use hot or cold, therefor if cold can squeeze straight into a spoon or quickly heat in a bowl. Textured but more or less smooth so easy to eat. Cheaper than other brands and does smell really nice. It's all ready and on the go so don't have to worry about mixing stuff up for the baby. I like the product as it's easy to use and simple. Baby like it and is easy on it's tummy. You can take it anywhere even if you don't have a fridge to keep it in. Can be closed and reopen for later with the same good quality. Would really recommend it to many. This pouche means my baby can enjoy dinner if I am cooking something that she’s unable to eat. It’s quick and easy and includes no harmful ingredients. My grandson loved this. Found it really tasty! Really easy to put in changing bag and prepare out of the house! Definitely be buying again. First time we tried this pouch our baby took right to it. it is easy to heat and serve straight from the pounch so ideal for on the move! 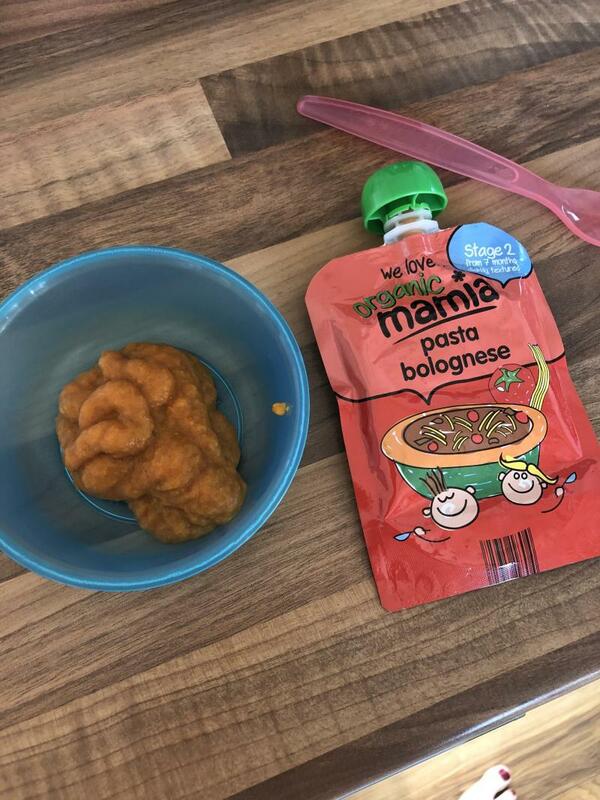 This pouch was an all round great meal quick and easy to prepare and use, also quite tasty which i was surprised at! all in all would definitely purchase this meal again as it was tasty, and full of nutrition. When I started weaning my little girl these pouches were so handy when out and about for the day. They take up little room in your suitcase. My little girl loved this one the best and could easily eat the whole pouch. Price. Taste. Ease of use. A bit runny to begin with! Very glad to have found these products in Aldi. They are incredible value compared to some of the other branded pouches available in supermarkets. Baby girl is so, so happy to eat this meal. We tend to use it for trips out so that we can just squeeze straight on the spoon for ease and quickness. She is more than happy to eat it at room temperature. The only issue we had to begin with is the first bit of food that comes out of the pouch is very runny, but once you remember this you are not fooled again! A great product overall. Let’s hope it stays in store. the Found the food easy to prepare and easy to get out the packaging. And was easy to take with me on a journey or if we were away on hoilday and as most places sell them I found them very reliable and in a great range. The bolognese is not the best one so start them on as the chunks can be big . This product is great. Its easy to pack, great tasting and easy for my toddler to handle. However, the lid has to stay off while she has it making a big mess sometimes. If i take it off her to put the lid on, she instantly wants it back! Could do with more flavour range. My daughter absolutely loved this !! She is quite a fussy eater . I feel they should be bigger . Over all I find this product amazing value for money. Healthy & convenient. I always take one we’re ever I go just incase . Occasionally I have found myself finishing her bowl of 😂. I call it a risk assessment. Great product, easy to use and you can buy special spoon heads to attach that makes it 100x easier. Price is fine if buying as a one off occasionally but when buying in bulk it’s easier to prepare your own food (you can buy pouches like these you fill yourself. I tried my baby on various pouches when introducing solids, this was a firm favourite. His mouth was open, ready for the next spoonful. He even went crazy when he could smell it! Absolutely fantastic, my twin girls loved these! We’re perfect as they were easy to prepare & feed when my girls were bein looked after ! Convent, and easy on the go. Mamia's 100% organic Organic Pasta Bolognese is suitable from 7 months onwards. A blend of organic beef, carrot, sweet potato and onion in a tomato sauce with organic cooked pasta. No added salt or preservatives. The texture encourages chewing.